LONDON: 18 July 2017 - The directors of ECR Minerals plc are pleased to announce that the Company’s wholly owned Australian subsidiary Mercator Gold Australia Pty Ltd (“MGA”) has been issued a new gold exploration licence (EL006280) in Victoria, Australia. This licence is to be known as the Moormbool project, and lies within the highly prospective Costerfield Domain. The licence is centred approximately 10km northeast of the high-grade Costerfield gold-antimony mine operated by Mandalay Resources. The Moormbool licence covers approximately 59 square kilometres and covers an area linking the Redcastle and Graytown goldfields east of a large regional fault. Due to pervasive alluvial cover, the licence area is largely unexplored. In close proximity to this regional structure and included within the licence is a magnetic anomaly interpreted to be a small intrusive plug or cupola. The Company interprets that if this is an intrusion, it may be genetically linked to the source of the gold mineralisation and a good target for exploration. EL006280 was registered on 11 July 2017 and is valid for a term of five years from that date, subject to the conditions of the licence. The principal conditions include a requirement for minimum exploration expenditures totalling AUD 136,950 over the five years. Only low impact exploration may be undertaken in the licence area until a work plan submitted by MGA has been approved by the Victorian authorities. MGA does not expect to submit a work plan until targets for drilling have been identified. 592 m of RC drilling was completed at the Bailieston project in June to test anomalies along the Maori trend, the Scoulars trend, and associated with the historic workings around the Byron Shaft, Samples were collected on one metre intervals and have been submitted to an independent laboratory for analysis using a bulk leach methodology. The Company is expecting to receive the results from the laboratory shortly and will update Shareholders as soon as the results have been consolidated and checked. 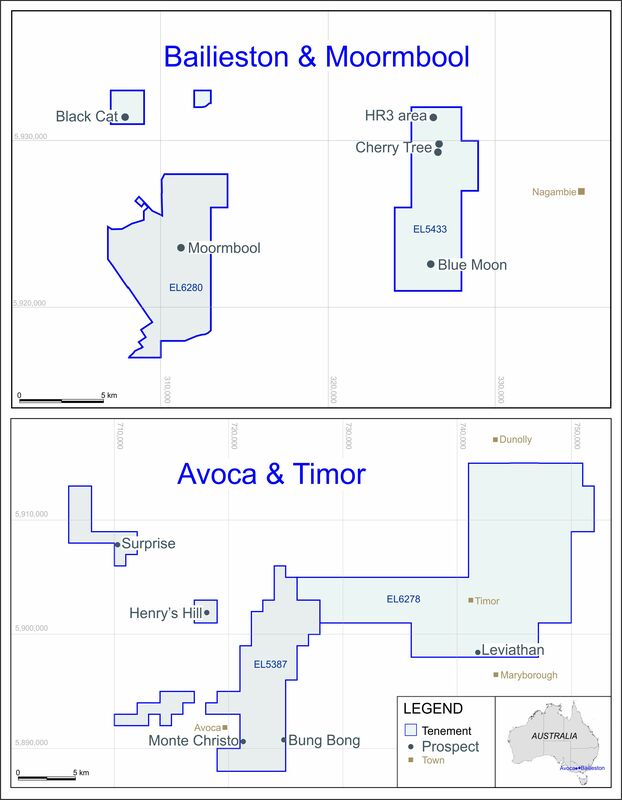 Information disclosed in this announcement has been reviewed by ECR's qualified person, Ivor Jones, Executive Director and Chief Operating Officer of the Company and a Competent Person within the meaning of Australasian Code for Reporting of Exploration Results, Mineral Resources and Ore Reserves' (the JORC Code) and for the purposes of the AIM Rules. Mr Jones holds a BSc (Hons) in Geology from Macquarie University and an MSc in Resource Evaluation from the University of Queensland. He is a Fellow and Chartered Professional (Geology) of the Australasian Institute of Mining & Metallurgy (AusIMM) and a Member of the Joint Ore Reserves Committee (JORC). ECR’s wholly owned Argentine subsidiary Ochre Mining has 100% ownership of the SLM gold project in La Rioja, Argentina. Exploration at SLM has focused on identifying small tonnage mesothermal gold deposits which may be suitable for relatively near term production.